2018 Downtown Holiday Decorating Contest - Celebrate Milwaukie Inc.
Again this year, the CMI Board would like to encourage downtown businesses to decorate for the holidays with a little friendly competition! Let’s make downtown Milwaukie a holiday season destination! The rules are simple — no application required, just decorate the exterior of your building before 5pm on Friday, November 30th, 2018 to be considered. 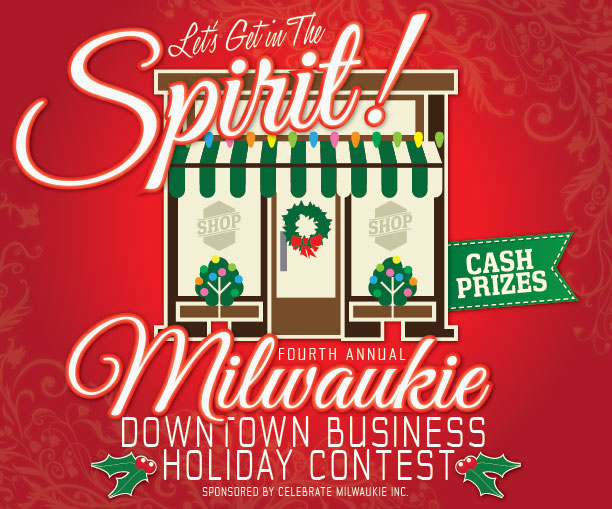 Decorations will be judged that night, and the three winners will be announced after the Umbrella Paradeat City Hall on on Saturday, December 1st. your commitment to a more vibrant Milwaukie! *Any business between 21st Avenue and McLoughlin Boulevard, and between the Post Office and Pietro’s, will be considered by the judges. While interior decorations are appreciated, too, only exterior decorations and decorations in lighted storefront windows will be judged.